In this series of blog posts, I’ll provide an example of using the Vital AI Development Kit (VDK) for Data Visualization. One of my favorite visualization applications is Cytoscape ( http://www.cytoscape.org/ ). 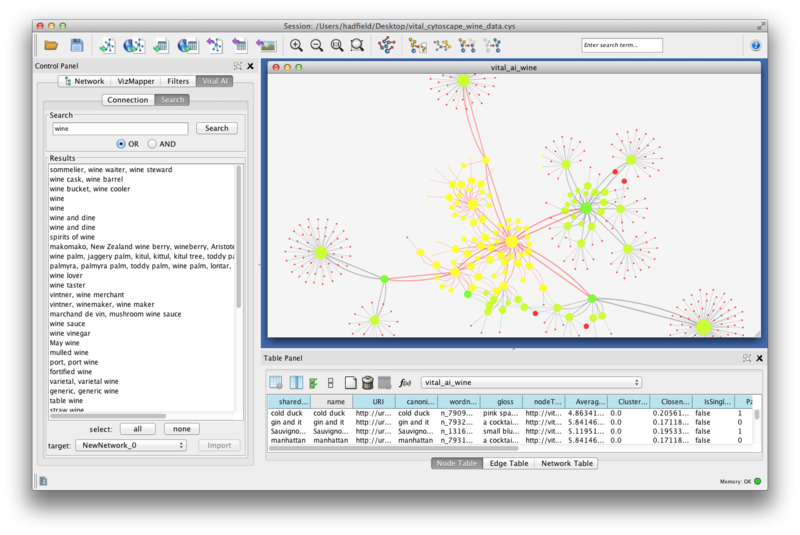 Cytoscape is often used in Life Science research applications, but can be used for any graph visualization need. I highly recommend giving it a whirl. In this example, we’ll create a plugin to Cytoscape to connect with the Vital AI software. Wordnet is a wonderful dataset that captures many types of relationships among words and word categories, including relationships like “part-of” as in “hand is part-of an arm” and “member-of” as in “soldier is member-of an army”. Wordnet was developed at Princeton University ( http://wordnet.princeton.edu/ ). Because Wordnet contains relationships between words, it’s an ideal dataset to use for graph visualization. The technique can be applied to many different types of data. Visually explore the Wordnet data, perform some graph analysis, and use the analysis output as part of our visualization.